With a great understanding of chemistry generally, the 19th Century saw the development of non-toxic dyes that revolutionised the textile industry. In 1856, the chemist William Perkin discovered aniline purple (or mauveine), and once the chemical process was properly understood many more colours were developed. By 1902 almost 700 synthetic colours were available in Britain. 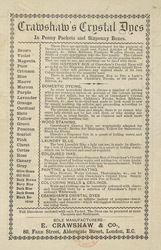 Some of these feature on this advertisement for Crawshaw's Crystal Dyes.